Securitization is a financial arrangement that consists of issuing securities that are backed by a pool of assets, in most cases debt. The underlying assets are “transformed” into securities, hence the expression “securitization.” The holder of the security receives income from the products of the underlying assets, and this has given rise to the generic term ABS (Asset-Backed Securities). The most direct link is in the case of fund units, such as UCITS: one unit in a mutual fund represents investments that the fund manager has made in stocks and bonds, and the value of the unit correlates directly to the market valuation of the securities in question. In the case of stocks and bonds, the security itself constitutes an asset for the investor and a liability for the issuer – capital in the case of stock, a long-term loan in the case of a bond. However, the purpose of this liability is to finance investments, and it is the investor’s confidence in the issuer’s ability to make the investment increase in value (i.e. create assets) that creates the incentive to purchase the security. However, in the case of stocks and bonds, the issuer’s ability to ultimately repay the security issued is subject to all sorts of uncertainties that go beyond the issuer’s managerial and entrepreneurial skills. It is different in the case of a security created through the process of securitization: since the security is backed by a pool of assets that already existed before the securitization took place, the issuer’s ability to honor the payments due has nothing to do with his or her own skills, but depends solely on the quality of the underlying debt. In most cases, the asset has already been created, which is why we use the term “refinancing” instead of just “financing” when talking about securitization. 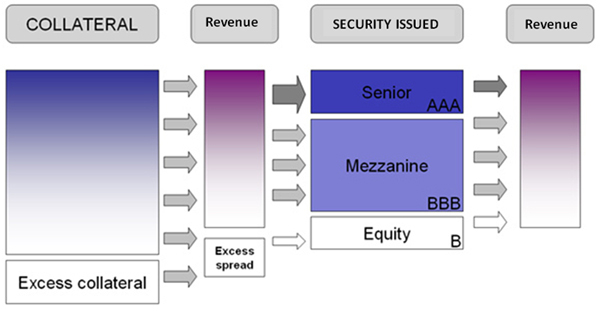 However, some securities can also be backed by future debt (see below). The advantage of a securitization transaction is that it enables the holder of the underlying debt to refinance that debt. Therefore, securitization involves assets that are typically illiquid (such as household debt), which are impossible to sell directly, since each individual debt is unique and requires separate administrative processing. Securitization also involves debts of smaller amounts, such as consumer debt, which, individually, generate relatively little income (in comparison to the amount of income typically generated by institutional investors) but which can be grouped together to make up a more valuable pool. Therefore, one of the main purposes of securitization is to create a marketable asset by combining several assets that, individually,are not as readily bought or sold, or in other words, to make a market for such assets. The entity that originally holds the assets (the originator) initiates the process by selling the assets to a legal entity, an SPV (Special Purpose Vehicle), specially created to limit the risk of the final investor vis-à-vis the issuer of the assets. An SPV is also referred to as a “conduit.” Then, depending on the situation, the SPV either issues the securities directly or resells the pool of assets to a “trust” that, in turn, issues the securities(the trust is actually used for several securitization transactions and therefore oversees several SPVs). 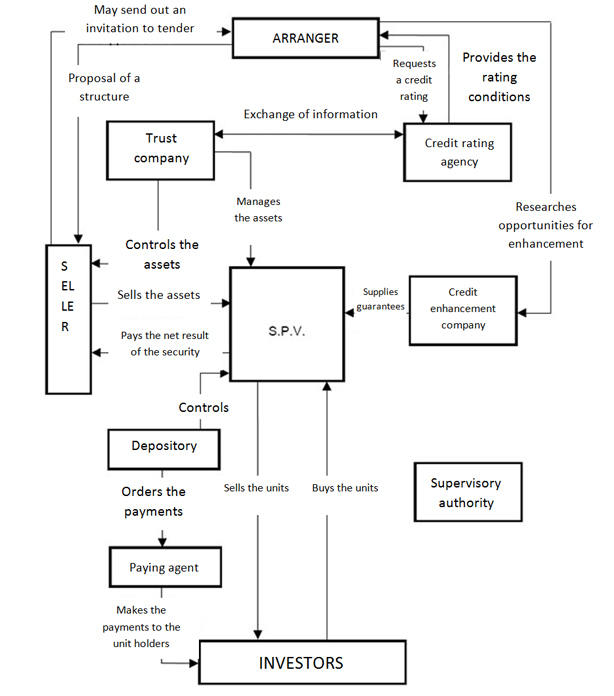 An SPV is more of a legal framework than an element that plays an active part in the transaction. The most important role is played by the arranger, typically a bank, who sets up the transaction and evaluates the pool of assets,the way in which it will be fed, the characteristics of the securities to be issued, and the potential structuring of the fund. The object of the structuring is to model the characteristics of the securities such that they correspond to the needs of the final investor. Instead of simply paying the final investor the revenue generated by the assets, the amortization rules for the security are defined in advance. Some ABSs are able to be “topped up,” meaning that the pool of assets can be refed during the life of the security. This makes it possible to refinance short-term debts (such as credit-card debt) with long-term bonds. Finally, the arranger plays an important role in distributing the securities to the final investors (distribution). Quite often, the securities are not issued on an exchange, but are distributed over-the-counter to a small number of investors. The trio of actors comprising the “originator, SPV,and arranger” constitutes the “Originate-to-Distribute” model, which has thrived over the course of the past few years. An important distinction must be made between “traditional” securitization, where the assets are actually sold to the SPV (“true sale”), and what is known as “synthetic” securitization, where the originator retains ownership of the assets and transfers only the risk to the SPV, via a credit derivative. This transaction brings no liquidity to the assignor, but enables himto externalize the risk associated with holding the securitized assets. All ABS are debt securities and therefore represent a debt that has a limited term and that pays a certain amount of revenue, calculated according to a set of predetermined rules (though this revenue is not necessarily guaranteed!). Beyond that, there is a wide range of methods to choose from for calculating coupons and repayment. The underlying assets are the SPV’s only source of revenue, which it can, in turn, redistribute to investors. There are two types of underlying revenues: interest payments on the one hand, and repayment of capital on the other. Naturally, the interest received is used to pay the interest on the securities issued, while the capital received is used to repay the securities themselves. Some ABS, however, are repaid in one lump sum at the end of the life of the security (“Bullet amortization”). Therefore, one characteristic of ABS is that, quite often, the effective date of repayment(s) is not specified at the time when the security is issued. Until recently, ABS had a good reputation in the markets, as they were thought to have a risk profile identical to that of a bond while at the same time being more lucrative. Nonetheless, there is still a risk of default on the pool of underlying assets. Therefore, there are several techniques, known as “credit enhancement,” that can be used to reduce the risk of default. Excess spread: the interest rate offered on the securities issued is less than the average interest rate received on the underlying assets. Overcollateralization: the overall value of the underlying assets is higher than the total nominal value of the securities issued. Subordination: the securities issued are not all identical, but are divided into a series of tranches. The repayment of each tranche is subordinates to (contingent upon) the repayment of the tranche that is immediately above it. The higher tranche is said to be more “senior,” therefore has priority over the intermediate “mezzanine” tranche, etc. The risk is compensated by higher interest rates: the higher the risk of default, the higher the interest rate will be. The lowest tranche, called “equity,” is typically not issued to investors, but is held by the originator. Margin deposit: the assignor makes a margindeposit with the SPV. Guarantee by a third party: monoline insurance companies specialize in providing guarantees for securitization structures. Derivatives (credit derivatives): the use of derivatives, particularly credit derivatives, also makes it possible to hedge against the risk associated with the pool of collateral. A “structured product” is therefore obtained, arranged such that the highest tranche has the best rating possible (“AAA” or “Investment grade”) from the credit rating agencies, the middle tranche(s) have an intermediate rating (“BBB” in our example below), and the lowest tranche is either not rated or rated “speculative.” It is worth noting that the “equity” tranche can either generate a comfortable amount of revenue (if all goes well) or no revenue at all and sometimes even not be repaid (if there are multiple defaults within the pool of collateral). The diagram below visually represents how the techniques of subordination (tranches), overcollateralization (excess collateral), and interest rates (excess spread) work. For the originator, the main reason for securitizing is to reduce (some might say “get rid of”) the amount of assigned debt from his balance sheet, which on the one hand leads to a corresponding reduction in his regulatory capital requirements under Basel II, and on the other hand enables him to bring in additional liquidity (which can be used to make new loans). ABS present an opportunity to invest in asset classes that are not accessible in the markets and that offer a risk/return profile that is, in principle, attractive. In principle, securitization helps to spread out risk within the market, so that the risk is no longer concentrated solely in the hands of credit agencies. With the subprime mortgage crisis and the ensuing crisis of confidence, the securitization market is losing steam, and certain segments, particularly those concerning the most complex products, have come to a complete standstill. ABS, which used to be a real “El Dorado” for investors, now fall within the “toxic” asset category. What happened? It is not really within the scope of our work at fimarkets to delve into economic analyses; nevertheless, here are a few ideas that you can investigate further in the articles cited at the bottom of this page. In reality, the complexity of the different types of securities is a disadvantage because it leads to what is known as “information asymmetry.” In other words, the issuer of the securities knows much more about what he is really selling than the buyer (investor) does. As long as the securities issued behave as indicated in the brochure, all is well and nobody asks any questions. But as soon as problems begin to arise for certain types of securities, people become suspicious of any product falling within that category – since you really need to be an expert to be able to evaluate a securitization program –and suddenly nobody wants to buy them anymore. Akerlof first described this mechanism in terms of the used-car market (“The market for Lemons”). In this regard, the credit rating agencies have received a great deal of blame for having been too generous in awarding “AAA” ratings, but the real problem is the loss of confidence that spreads throughout an entire asset class to a completely irrational degree. Moreover, securitization, as we have seen, offers banks an opportunity to trim their balance sheets, which makes it easier for them to fulfill their regulatory obligations. They have jumped at the opportunity. At the same time, they have veered away from their basic function, the cornerstone of which is to accurately assess credit risk. With the extension of credit becoming increasingly easy, credit agencies have become less stringent with regard to the quality of the final borrowers. This is referred to as “moral hazard.” The banks have moved away from their role of financing the economy, seeking instead to assume (fortunately, not completely) a purely intermediary role in an economy that seems to have become completely “marketized.” Today, the situation is reaching its limits. If you would like to learn more about ABCP (Asset Backed Commercial Paper) and the associated conduits (SIV), you can read this article by Barbican Consulting. The following article complements the information found on this page with a more “commercial,” but still relevant, approach: “Asset-Backed Securities, guide pratique pour les investisseurs” (French only). If you’re looking for a laugh, check out this little allegory for a not-so-politically-correct, but incredibly apropos, take on the subprime mortgage crisis. Translated from French by Holden J. Ferry.